Improve return on investment in Riak CS by integrating with Treasure Data. 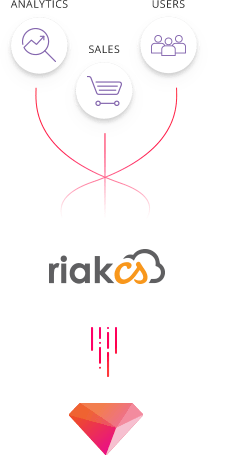 Leverage the highly reliable and scalable distributed databases of Riak CS and make them even more useful by pairing them with the Treasure Data Customer Data Platform. Riak CS holds enormous amounts of unstructured data, and Treasure Data helps you dig deeper into your digital stores of information than ever before. Imagine being able to ask a question about your data and receiving the right answer in moments. That could be a real game-changer for the way you run your business. By integrating with Riak CS, Treasure Data brings you one step closer to having all of your mobile, social, cloud and IoT data in one place. Treasure Data enables you to process tremendous amounts of information so that you can improve your relationships with your customers and make data-driven decision that make your business more profitable. Dive deeply into your unstructured data to learn more about your customers or about market trends. If you are gathering lots of data from IoT sensors, find out how you can operate more efficiently with this information. Videos, images and other large files hold valuable information. Now you can query them easily with Treasure Data. Want to know what your Facebook and IoT data say? You can mash them up thanks to Treasure Data. By combining all your data, you gain new insights you wouldn’t come across otherwise. Unstructured data is a valuable source of customer sentiment. Learn what your customers are saying about you. Treasure Data lets you run analytics on your unstructured data so you can improve your relationship with customers. Are you ready to move into a new market or introduce a new product? Let your data tell you. Treasure Data’s analytics functionality highlights new opportunities or trends which you can capitalize for sustainable growth. Enable the Riak CS Data Connector with a simple, 3 minute setup. Analyze your Riak CS data beyond what’s possible in Riak CS reporting with a few lines of SQL. Query and analyze unstructured data, large objects and time-series information to make better business decisions. Use Treasure Workflow to automate your analysis, work more efficiently and minimize errors. You don’t have to hunt for information because it’s all at your fingertips. Riak CS standard objects including: file formats, encodings, column names and types. Available Riak CS Custom Objects: Any custom data stored in Riak CS.